SP-P109's spring release function comes with a steel metal spring, visible when the top lever is not pressed down. The 1" cordlock accommodates larger cord sizes up to 6mm (1/4") in diameter and its extra height gives room at the bottom half of the cordlock for custom imprinting. 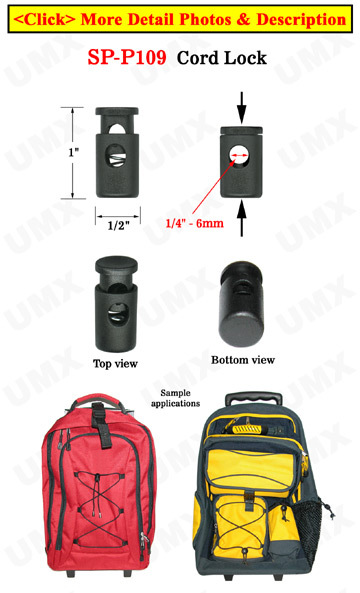 Use the cordlock for backpacks, sports bags as well as clothing. This item is offered to crafters, manufacturers and individuals at low wholesale prices. Optional custom logo imprinting is available. Apply application by pressing down the top lever and inserting cord into the hole provided. *Sold as 100/pc order. Please see the link below to be directed to the small quantity page. **Cord sizes larger than 6mm may be used depending on the softness of the material of the cord. Email To sales@usalanyards.com For Best Offer and Delivery Schedule, Thanks!